There is a line between territory and ownership, a vast difference in the words home and hometown. A new three-part play, “Overnight” presented at The Flight Deck in Oakland, leaves the tongues of a community spinning helpless questions, pointing faultless fingers, and, in resignation, acting upon the last match in the box. A skyscraper, a monolith, a great middle finger, sprouts up overnight in Oakland. Each theater company addresses the affront with a rich multitude of character and class. The idea behind this project actually took root a couple of blocks from The FlightDeck as a parking lot was recently and expediently approved to be replaced with high end condos. And so these artists did what artists so often do best: they scratched their heads and raised awareness. The issues at hand are not easily addressed; everything about the building of these skyscrapers is technically legal, and they are, after all, built on private land by private parties. So what is all of the fuss about? This is where the concept of hometown comes in to play in the play. There is a collaborative push to hold ground on culture, to retain community, and to do so with pride. The production starts small and simple, a conversation between two people just trying to get by, just trying to figure out what they’re doing with their lives. The company responsible for this story, Theater Aluminous, works hard to humanize and develop an honest changing tide between two unlikely characters, strangers uniting against the singular enemy of sterile and blunt capitalism. Once the audience has their minds seated within this community, within this instantaneous threat to our hometown as we know it, we are slipped inside a coffee shop, ever so aptly titled “Manifest Destiny.” Ragged Wing (the second participating company) plays on a weighted scale slipping into the first sight of dystopia. The writing in this story is somehow both hilarious and tyrannical. Not only is the elephant in the room discussed, so is everything that it is not. This act explores the responsibility of blindly allowing change in our communities, while losing oneself to rampant consumerism. There is an austere progression to the themes of “Overnight.” This becomes most prominent within the final act. It is entirely evident what this skyscraper is, what it means and who it houses. Yet can provoke attitudes so stark, contrasts so strong, as to leave us questioning our goodwill, even the fabric of our character. The Lower Bottom Playaz puts forth these otherworldly conundrums with an ease and entitlement to truth. The ending audibly dropped a number of solemn jaws. Young performers from Oakland’s Gritty City Repertory Youth Theatre provided effectively choreographed scene changes throughout the production. I applaud the variety with which the Mcguffin of this skyscraper is handled by these theater companies. If they are not hitting their audience on one level they are most likely knocking them out on another. There is also a great importance in this reach of theirs, for it is a must in spurring a dialogue in times when whole communities can up and change overnight. “Overnight” plays at The Flight Deck in Oakland through April 22nd. For further information, click here. 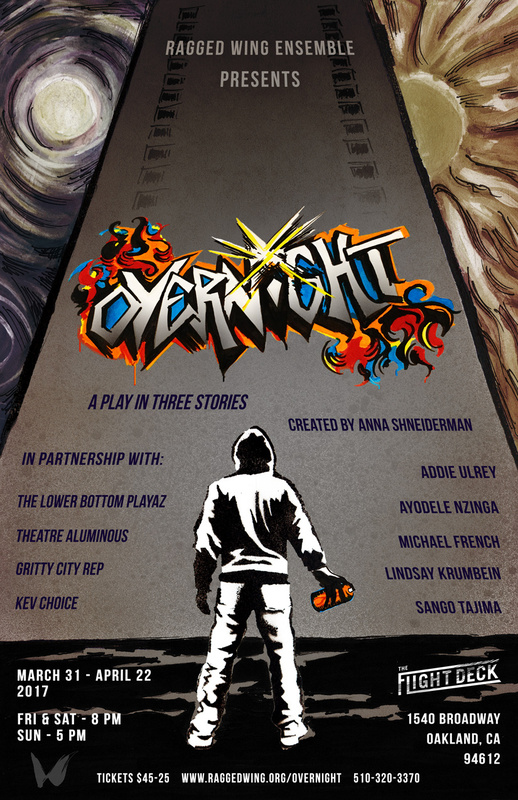 “Overnight,” produced by Ragged Wing Ensemble in collaboration with Gritty City Repertory Youth Theatre, The Lower Bottom Playaz, Theatre Aluminous, and Kev Choice. Created by Anna Schneiderman. Director: Lindsay Krumbein. Kieran Beccia: Board Op. Kev Choice: Composer. Ella Cooley: Sound. Regina Evans: Costumes. Andy Falkner: Props. Lilli Fore: Sets. Michael French: Director. Akaina Ghosh: Production Manager. Lindsay Krumbein: Choreographer. Marc-Éddy Loriston: Projections. Kenitra Love: Assistant Stage Manager. Serena Morelli: Photography. Ayodele Nzinga: Writer/Director. Marisa Ramos: Assistant Stage Manager. Jean-Francois Revon: Production Design Head., Amy Sass: Dramaturg. Anna Shneiderman: Creative Producer. Keira Sullivan: Lighting. Sango Tajima: Writer. Jane Troja: Stage Manager. Addie Ulrey: Writer/Director. Gritty City Rep: Que’Aire Anderson, Ayah Dominique, Alex Trono. Theatre Aluminous: Imari Anderson, Lily Tung Crystal. Ragged Wing Ensemble: Fenner, Anna Maria Luera, Mary Matabor, Venus Morris, Emmy Pierce. Lower Bottom Playaz: Stanley Hunt, Megan Lipari, Reginald Wilkin. Posted in Reviews.Tagged Charles Kruger, Gritty City Repertory Youth Theatre, Lower Bottom Playaz, Overnight, Ragged Wing Ensemble, San Franciso bay area theater reviews, Sean Taylor, Theatre Aluminous, theatrestorm.